Due to systematic barriers in society ranging from inaccessibility to limited educational training opportunities, the ability to secure long-term, well-paying employment has been difficult for Deaf and hard of hearing Marylanders. More than 80 percent of the Deaf and hard of hearing population are either underemployed or unemployed. Deaf and hard of hearing business owners have also faced societal barriers, hindering their ability to maintain and expand businesses. 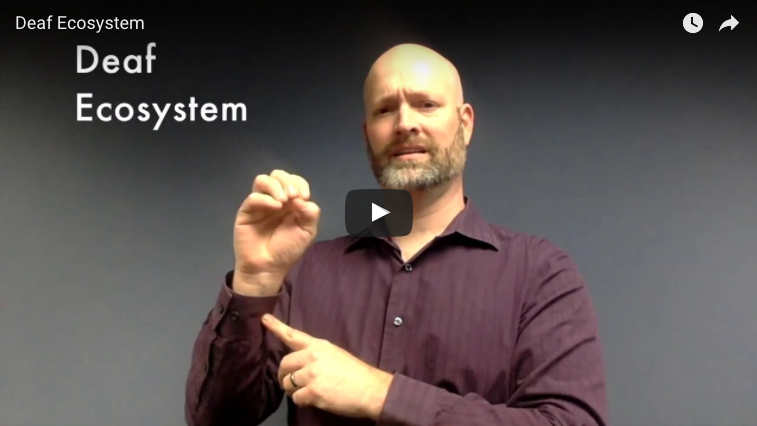 The Deaf Ecosystem, a term coined by Director Kelby Brick, is a critical tool in combating the pervasive underemployment and unemployment that many Deaf and hard of hearing individuals experience. As commonly witnessed with many other minority groups, the Deaf and hard of hearing community’s collective wealth and opportunities are often exploited and dispersed into the larger society. Because resources tend to leave the community, Deaf and hard of hearing individuals are disempowered with severe negative impacts on their socio-economic status. To enable empowerment, purchasing power, and economic mobility of Deaf and hard of hearing individuals, the Deaf Ecosystem’s fundamental approach is to retain and harness the collective socio-economic power within the community’s individuals, organizations, and businesses through community collaboration and support. Examples include fostering an inclusive entrepreneurial environment where Deaf and hard of hearing individuals can realize their potential without any barriers, supporting and patronizing local Deaf and hard of hearing businesses, and hiring Deaf and hard of hearing professionals and employees. By working together and supporting one another, the Deaf and hard of hearing community is able to accomplish more than they can alone. Ultimately, a strong Deaf Ecosystem will lead to increased social and economic clout from the retention and expansion of jobs, resources, and wealth within the Deaf and hard of hearing community. The community’s increased influence is leveraged to support the community in turn, creating a synergistic effect. The synergy leads to more healthy, productive, and empowered Deaf and hard of hearing citizens. Social, political, and economic barriers no longer stand in the way and discrimination is eradicated.